Looking for renovation inspiration? 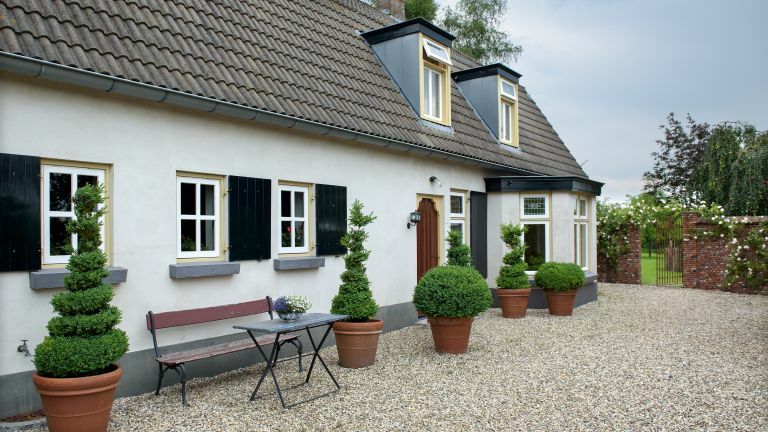 Take a look around this real home transformation of a Dutch farmhouse that had been in the same family for several generations. See how the owners have restored original features and breathed new life into the home by converting an adjoining barn. The property A farmhouse built in 1920 in a countryside hamlet in Gelderland, eastern Netherlands. The cities of Nijmegen and Arnhem are a half-hour drive away. Jos Dekkers still remembers how, as a young boy, he would help his father pick cherries in the orchard of the family farm, climbing at least 40 rungs to get to the top of the trees. ‘My father knew exactly how to position the long ladder, so it wouldn’t fall if a branch broke off.’ He has many fond memories of his childhood here at De Vliervoeters, in the eastern Netherlands. He was born and raised at Laag Vliervoet, the farm built by his grandparents in 1920. His parents moved into the house when his grandfather died, so his grandma wouldn’t be on her own. Years later, in 1985, Jos and his wife Paulien took over the farm from Jos’ mother when his father died. The house was well cared for, but the interiors hadn’t been touched since the 1970s, so the couple began years of renovation to give the farm back some of its old charm, and create two new guest rooms for their B&B. The couple started with the old stable; Jos remembers his father keeping six cows here, but now there’s a large dining table and a cosy seating area on the ground floor. The original beamed ceiling lends real character to the space, while on the floor are reclaimed tiles. ‘We didn’t have enough tiles, so we added in some old pavers in a herringbone pattern, and that worked,’ says Jos. A narrow staircase leads to the attic, once the hayloft, but now a cosy bedroom with a wooden floor and country-style tongue and groove on the walls. Jos and Paulien crafted a bedstead from two reclaimed doors they found in a salvage yard, but their most beautiful find ever can be seen in the bathroom, with its nostalgic red-and-white tiled floor. With the first bedroom finished, Jos and Paulien turned their attention to the beautiful old barn, once used for storing the fruit harvest. Jos recalls it stacked high with wooden boxes full of cherries, apples, pears and plums waiting to be transported to the fruit auction house. The ‘new’ barn provides a second guest room off a traditional Dutch kitchen, complete with wood-burning stove and a colourful tiled floor that continues into a pretty bedroom. A sliding door – made from salvaged doors – divides the bedroom from the bathroom, with more reclaimed floor tiles. Jos and Paulien paid incredible attention to detail in their quest for an authentic, characterful look; in fact the whole barn is furnished and decorated with treasures from fleamarkets, charity shops and reclamation yards. The surprisingly spacious hayloft bedroom is simply furnished with rustic farmhouse furniture. When it comes to the materials they reuse, however, they are not purists. ‘The floor tiles in our bathroom came from a much more grand house, but they fit in here, too,’ says Jos. They try to choose things that date from the same period as the farm, to get an authentic period look, and when it comes to décor, Paulien tirelessly tries to find the right paint colour with the right look for the right spot. A fan of old furniture, Paulien wishes she could ‘step into a time machine to see how they were used and by whom.’ Regardless of their origins, the furniture and accessories in the guestrooms look as though they have always been in the house. Robust and simple, with a touch of romance here and there – pieces of lace decorating a shelf, flowers in an old teacup – each and every piece was collected by Paulien. ‘There was nothing authentic left; it was all destroyed when the house was modernised in the 1970s,’ she says. ‘We’ve gathered so many things that we could easily start another project!’ But they won’t; the time has come to relax and enjoy what they have created: a beautiful farmhouse idyll.